Inventory We are a resale marketplace, not a box office or venue. Ticket prices may exceed face value. This site is not owned by Fox Theater St Louis . 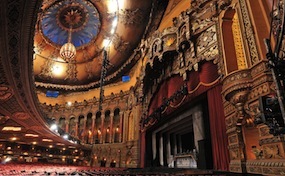 The Fox Theatre, a former movie palace, is a performing arts center located at 527 N. Grand Blvd. in St. Louis, Missouri. Also known as 'The Fabulous Fox', it is situated in the arts district of the Grand Center area in Midtown St. Louis, one block north of Saint Louis University. It opened in 1929 and was completely restored in 1982. The Theatre hosted a 60th birthday concert for St. Louis born, early rock and roll pioneer, Chuck Berry in 1986. Keith Richards, of The Rolling Stones, was the project's musical director and backing band leader. Taylor Hackford incorporated the concert into a documentary film about Berry and released the film as Hail! Hail! Rock N Roll, as a feature. In the film, Berry mentions that, as a child growing up in St. Louis, he was denied entrance to the Fox to watch a film because he was black. TheatreStLouis.com is not affiliated with any primary box office or supplier. We are a privately owned and operated business specializing in sales in the secondary market. To buy tickets for any Fox Theatre St Louis events in St Louis simply click on the event of interest or call our operators at anytime.